According to the American Heart Association, the American Cancer Society, and the United States Department of Agriculture’s Nutrition and Your Health, Dietary Guidelines for Americans, healthful, nutritious eating patterns can stem from many combinations of foods from all of the five major food groups including the meat group. Less than 50% of the fat in pork, beef, and veal is saturated. The average fat and cholesterol content of trimmed, lean pork is 31% lower today than it was 20 years ago. The amount of cholesterol in pork is no more than that of chicken or turkey. A three ounce serving of cooked lean pork has 78mg of cholesterol compared with 76mg in cooked, skinless chicken. Pork today is very lean and shouldn’t be overcooked. Cook pork roasts, tenderloins, and chops to an internal temperature of 145°, followed by a three minute rest time, Ground pork, like all ground meat, should be cooked to 160°. 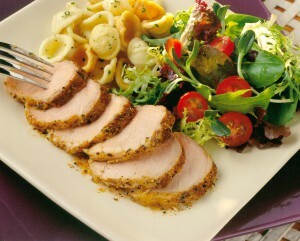 In addition to protein, pork is an excellent source of zinc, vitamins B12 and B5, thiamine, and iron. Protein is the building block for the body. It strengthens the immune system and helps maintain the blood. The protein in meat (pork) is “complete” protein — it contains vitamins, minerals, and amino acids. Growth hormones are NOT used in pork production. Pork is the number one consumed meat in the world. Pork is the most versatile meat — it can be marinated, dry rubbed, roasted, microwaved, grilled, skewered, pan-fried, stir-fried, boiled, barbecued, and baked. Pork can be included on a heart-healthy menu with six outstanding cuts.